The Neleo Range of semi-automatic spiral wrapping machines boast some of the most impressive features in the industry. With low power consumption and incredible wrapping speeds, these machines are perfect for all types of industry. Compact Design to be easily placed in your current packing operation, increasing efficiency. Safer, faster, cheaper and more efficient alternative to layflat tubing and shrink wrapping film. Ideal for use across all industries including; Logistics, Construction, Timber & Automotive. Large range of optional accessories also available such as; Automatic Film Cutter and Fully Customised Infeed & Outfeed Roller Conveyors. Spiral wrapping machines are an excellent development in the packaging world and the benefits of using the Neleo range are continually increasing. These versatile and compact machines are the perfect addition to any packing line, allowing you to wrap and protect your goods in a very efficient and effective way. The Neleo machines, also known as “orbital wrappers” from Plasticband, use a semi-automatic operation and allow the user to be fully in control of the wrapping process. This means that if more film needs to be applied to certain areas of the product, such as the ends, this can be done by simply adjusting the wrapping speed or just moving the product slower through the machine. Efficient, effective and economical way to protect long and awkward shaped products. Relatively low power consumption with 240V Plug, minimal setup required. Reduce the range of packaging material you use as the film can be applied to random shape products. Printed film for increased brand awareness or Paper & Film combination can easily be applied. Bubble wrap or corrugated paper can also be loosely placed on the product and then wrapped tight as the product passes through the machine, offering more impact resistance. Very neat application of film offers excellent presentation. Many accessories available that integrate seamlessly with the machine to make the machine and packing line even more versatile and efficient. Very intuitive control panel, film tension and speed adjustment make the machines very user-friendly for operators of all nationalities. Footswitch operated machines with extra safety features added to reduce the risk of injury or damage. The high-strength film provides excellent protection and security for the products. Compact design with a reduced footprint for easy installation into your current packing operation. Double film head carries two rolls of film, creating unrivalled wrapping times without having to increase the speed of the ring to an unsafe speed. This also reduces machine downtime due to fewer roll changes. All these orbital wrapping machines are made in Europe by Plasticband and are all CE marked. Intuitively designed, personalise the wrapping speed required to suit your individual product. This ensures the correct amount of film is used in different areas of the product, such as at the ends. The wrapping speed can be adjusted accordingly, reducing bulky wrapping and improving overall efficiency during the packaging process. Ensuring a professional finish, this in-built system provides the perfect cut on the film. It allows your business to minimise wasted product through a reliable and trusted service. Once your product is wrapped securely and to the right tension, this double cutting system performs two swift cuts which you can then smooth out as required. For the safety of your workers, the Neleo is supported securely throughout use with the choice of either sturdy feet or locking castors. This allows it to be manoeuvred into space easily and accommodates a change in location when required. During use, this option keeps the machine in a safe and reliable position at all times. As a semi-automatic machine, the Neleo range is operated manually through the use of a safety foot pedal with some models compatible with the One-Touch™ new generation control pedal. This allows you to control it’s operation, putting the safety of every worker first. In addition, it also reduces the potential risk of both injury and damage throughout the entire packaging process. The double film head helps you to create unrivalled wrapping times without needing to increase the machine’s speed to an unsafe level. You also effectively reduce the machine’s downtime due to replenishments and are able to effectively control the wrapping tension to suit the needs of each of your individual products. 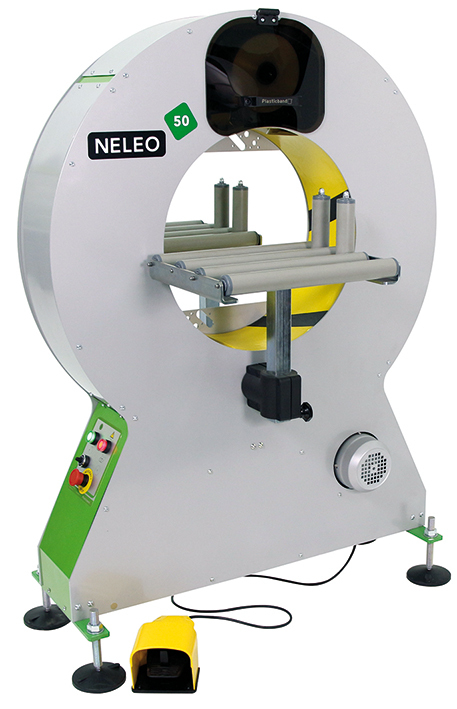 The Neleo is a professional level machine designed for high-volume use. By focusing on high-quality materials, we ensure your packaging line maintains it’s new efficiency for longer while minimising unnecessary repair costs for your business. All models within the Neleo range are fully CE compliant to support the requirements of your industry. The safety of your workers is of the utmost importance. The Neleo machines have a range of integrated safety features including the ring protector. As a semi-automatic machine, this allows you to comfortably implement an innovative machine into your workplace without putting your workforce at any risk throughout the packaging process. Designed to suit a range of different industries, the Neleo range can be customised to fit your business needs. Conveyors are available to suit large and small products as well as those with extra length or bulk to them. Additional guides also ensure the smoothest packaging process by directing your product through the optimal line at all times. Whether you’re looking for to boost brand awareness or increase impact resistance, the Neleo machine can be personalised with a range of wrapping combinations to suit your needs. From printed film and opaque security film through to integrated bubble wrap or foam dispensers, choose the solution that best protects your products and meets the requirements of your industry. We have a range of machines within the Neleo range designed to suit your requirements. 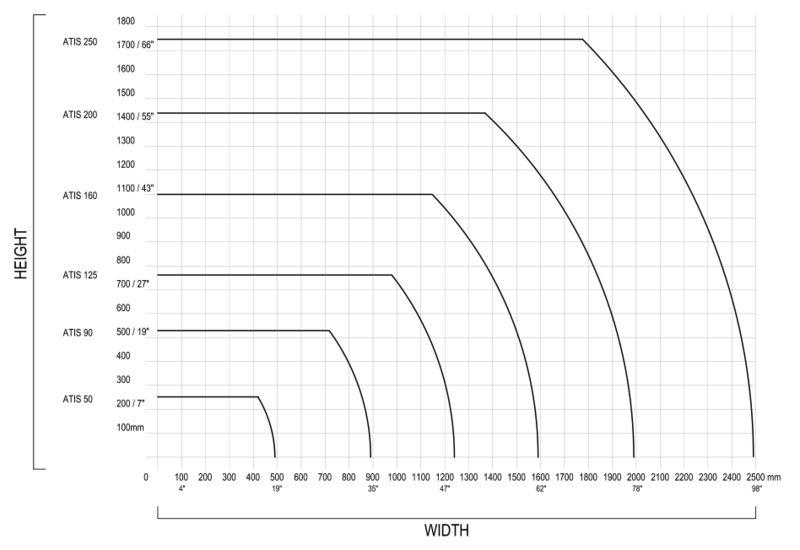 Below, this chart shows the different models in correlation to the product height and width requirements. We recommend you match your Neleo machine in accordance with your product dimensions to ensure the most professional wrap. As one of the most impressive models in the industry, the Neleo range can be tailored accordingly. If you’re thinking about improving your packaging line and investing in the growth of your business, contact Kingfisher Packaging today for more information. As experts in our field, we are here to provide you with the right packaging solution for your needs.